Wow that experience Hendrix looks amazing. I have someone offering me tix to Neutral milk hotel for $100/2. Might have to do it. Going to see The Magic Band play on April 6. I'm never going to get the real thing but this is just as good, it's got original members and youtube videos haven't disappointed me. Going to a bunch of cool concerts in the next couple months, actually. Morrissey, Neutral Milk Hotel, Nick Cave, and Elvis Costello (solo acoustic). Swans in June : )! At the Disney, they seemed to have put a lot of thought into those setlists. that you didn't hear something at one concert, it'd show up at another. possible considering they were trying to keep the shows at a reasonable length. I checked on tickets for the Merrilville show. 75USD for the nose-bleed cheap seats and there were only 8 left. A bit too rich for my wallet, plus it's too far away. Living a mile away from one of the biggest outdoor venues in the area has me a bit spoiled, so unless it's at "The World" (used to be called The World Music Theater, now it's The First Midwest Bank Ampitheatre) I tend to wimp out on far away shows. 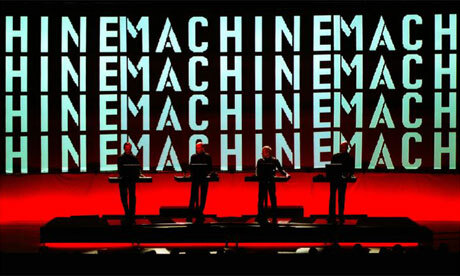 Kraftwerk, United Palace, April 1, 2014 NYC. First announcements for Damnation haven't disappointed. I was incredibly jealous of the Saint Vitus 'Born Too Late' US tour, so the recent announcement of their booking has me a little giddy.